Third-year law students Lauren Emery, Woody Angle, Kaitlin Price and Professor John Korzen pose in NYC during the National Moot Court finals. 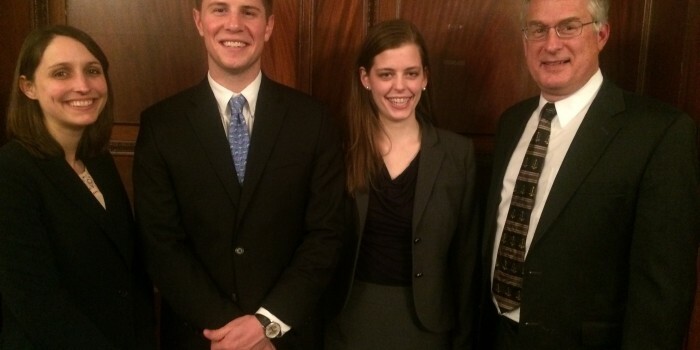 The National Moot Court Team of Robert “Woody” Angle (JD ’16), Lauren Emery (JD ’16), and Kaitlin Price (JD’16) recently competed in the National Finals of the 66th annual National Moot Court Competition, which were held in midtown Manhattan.The team made it to New York after winning the Region IV regional tournament in Richmond, Virginia, sweeping all five of its matches and winning the best brief and best final round oralist awards (won by Price). Wake Forest became the first team to “three-peat” in Region IV, which is the largest of the 15 regions in the competition. This year Region IV had 21 teams from 12 law schools. In New York, Wake Forest joined twenty-nine other teams from around the country, the first and second place teams from all the regions. Wake Forest’s brief score was the tenth highest out of all 30 teams, an excellent showing. In the first round, Wake Forest was randomly paired against the team with the second best brief score, William Mitchell. Emery and Price won the oral argument portion of the round, with Emery doing a fantastic job responding to questions from an extremely hot bench, but the team narrowly lost the match due to the brief score. In the second round, Wake Forest faced a team with a slightly lower brief score, Loyola of Chicago. Angle and Price won the oral argument portion of the round, and the team stood at 1-1. Unfortunately, the team’s overall point differential left it just short of advancing to the elimination rounds, despite having the tenth best brief and winning the oral portion of both matches. “The team had a great experience and represented Wake Forest very well,” said one of the teams’s faculty advisers Professor John Korzen, director of the law school’s Appellate Advocacy Clinic.